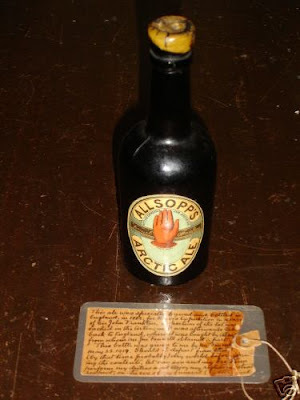 What you are looking at is an actual museum quality sealed and intact bottle of Samuel Allsopp’s Arctic Ale brewed for the 1852 Expedition to the Arctic lead by Sir Edward Belcher. This bottle of beer is likely the rarest, oldest, and most documented bottle of beer in existence! Not to mention the unbelievably unique history surrounding it. Accompanying the bottle is an actual limited handwritten history about the bottle itself.